Once at the ancient city everything is walkable, but if you need a bus they seem to be everywhere (and free for pensioners). Everyone pays for the ‘hop on – hop off’ city sightseeing double decker, a ‘must’ on arrival. The city offers free wi-fi too. Helpful for getting around. A ‘click’ gives you an app regarding attractions at your location. Your emails can come in too if you don’t feel you want to be cut-off. Our base for a two-night, full three-day, trip was the Royal York Hotel, adjoining the station, and also close to the National Rail Museum. A large Victorian hostelry, sympathetically modernised, it has a decent size swimming pool, gym and spa, and sits in lovely grounds with a walk down to the River Ouse. The York Pass costs £48 per adult for two days and £24 for a child but we booked on-line and gained 10% benefit. The pass is per day and not on a 24-hour basis, but is very good value (and covers all the attractions that follow except York Boats, and Betty’s and the hop on hop off bus which gives a discount). Typically the York Dungeon would be £15.60 entry, the pass covering over 30 attractions. York is a historic city dating back to Roman times and also with a tragic Jewish connection. In 1190 the Jewish citizens sought refuge from a mob in what is now known as Clifton Tower, then a wooden structure. It was set on fire. All 150 perished. National Heritage has placed a plaque by the entrance to the substantial keep dominating that part of the city which was built at a later date. The now world famous Jorvik Viking Centre is an ‘experience’ and visitor pull of magnitude welcoming 17 million visitors over the past 30 years. It was created by the York Archaeological Trust in 1984 following extensive archaeological discoveries. Riding in suspended capsules (Disney-style) visitors are taken back to 975 AD embarking on a tour of a reconstructed Viking settlement which includes Viking voices speaking in Old Norse, as well as aromas and life-like animated figures, made by laser technology from skeletons found on the site. Voted by our young guest as the best part of the visit was the York Chocolate Story, one and a half hours of pure gluttony. Right in the centre of the historic city, it is at Kings Square close by a narrow street called The Shambles. An entertaining tour guide takes you through the history of York’s most famous chocolate-making families and their finest creations, including the Rowntree’s, Terry’s and the Birmingham-based cousins Cadbury. You indulge on each floor of the building and make your own chocolate bar to take home with you. 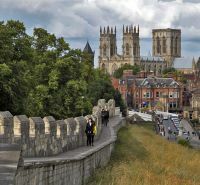 York, as befits its name, was the main base of Richard III, Shakespeare’s villain, alleged to be responsible for the death of the Princes in the Tower (of London). 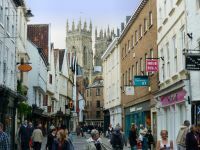 The local historical society failed in its bid for his recently recovered remains to be interned in York Minster but his battles and short Kingship are well documented in the Richard III Experience, sited at Goodramgate on the city walls. He was succeeded by Henry VII, who has an exhibition at Mickelgate. All tastes are catered for as far as dining is concerned at York but it is Betty’s, a patisserie, that is the big attraction. The afternoon teas are delicious. What to do in the evening? One suggestion is to take a 70-minute river cruise on the Ouse as far as Bishopthorpe Palace, the official home of the Archbishop of York. The York Cruises captain gives an interesting commentary on the development of the river during the industrial revolution, and there is a bar on board too. We were also shown how high the river can rise during the rainy season, 16ft above its normal level. The Theatre Royal York claims to be the oldest in the country and dates from 1774. Backstage are the remains of a Roman structure. We were fortunate in that Bob Golding’s 'Morecambe' was playing, Ernie Wise a dummy. Our little one was quick to shout “Rubbish” when required, and we were treated to video clips of Shirley Bassey, Glenda Jackson and Andre Previn (in that order!). 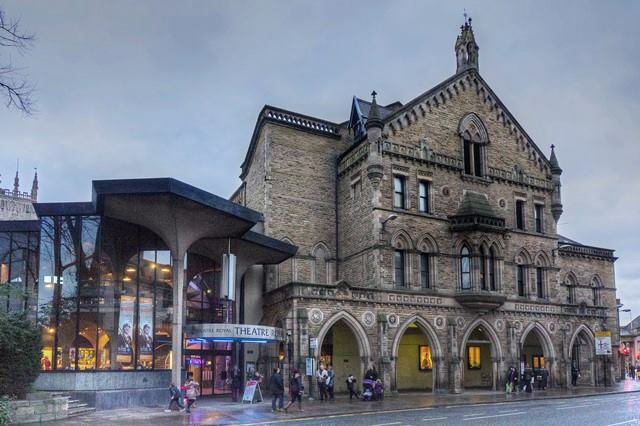 The theatre programme changes every week, as does the Grand Opera House, which hosts the major touring shows. York Minster is one of the great cathedrals of England with some splendid stained glasswork. The building is in fine condition. There are tours and organ recitals.